Buy online Elder White Carrera and Dark Brdiglio Line 12 in. x 12 in. 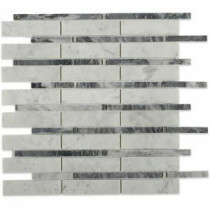 x 10 mm Polished Marble Mosaic Tile HD-ELWTCRABRDG and leave review or share with Your friends. Each piece of the Elder White Carrera and Dark Brdiglio Line 12 in. x 12 in. x 10 mm Polished Marble Floor and Wall Mosaic Tile stone tile fits into the next like a perfect puzzle. It's stunning design and unique pattern will bring warmth and a natural ambiance to your home. The mesh backing not only simplifies installation, it also allows the tiles to be separated which adds to their design flexibility. Due to the nature of stone, variations in color and veining may occur. This is the natural beauty of the product.